The Southwest is so rich in beauty and history—Grand Canyon is just one amazing part of it. At Hatch, we love where we live and are always excited for an excuse to get outside and experience it. This August brought us one of the best excuses ever: an eclipse visible across the entire United States! Since we still had work to do getting all of your trips safely on the river, we couldn’t stray too far from our Flagstaff office. 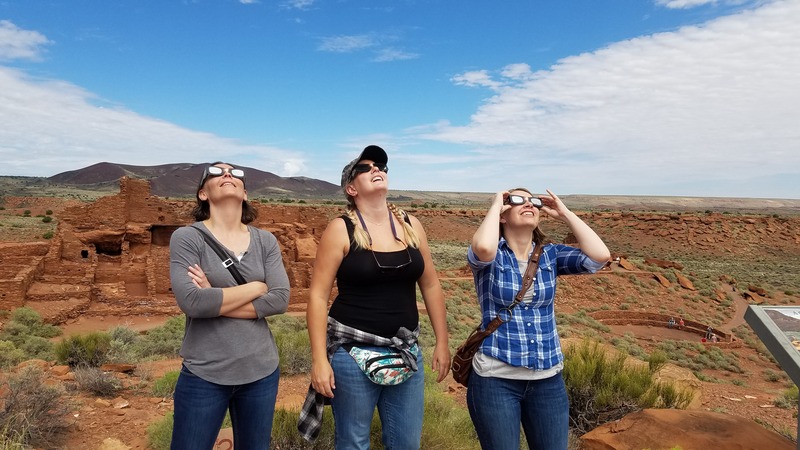 We elected to view the eclipse from Wupatki National Monument, the site of several crumbling 900-year-old masonry pueblos. We were surprised to learn that John Wesley Powell, famous for his explorations of the Grand Canyon via the Colorado River, had also made his way to this monument and even gave the name “Sunset Peak” to the nearby Sunset Crater Volcano in 1892. We were fascinated to learn that being visited and recorded by Powell was not the only thing these pueblos had in common with our favorite Grand Canyon sites. 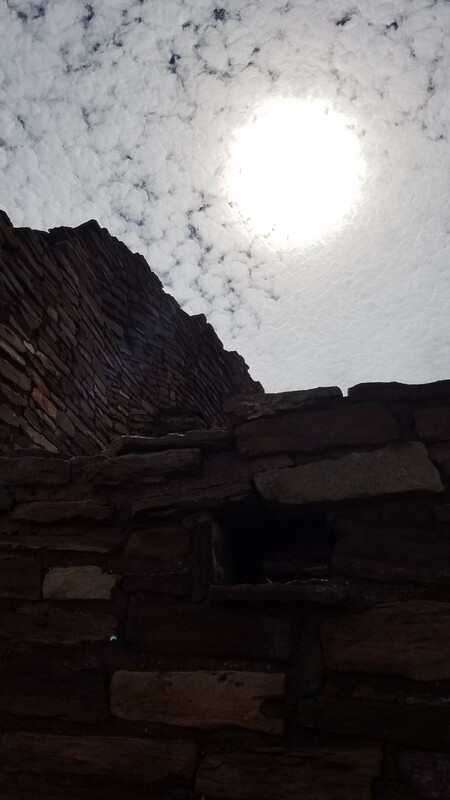 Although thousands of people lived and farmed at Wupatki during the 1100s, by 1250 no occupants of these multi-level stone structures remained. Likewise, ancient peoples began permanently occupying the upper section of the Grand Canyon in places like Unkar Delta and Nankoweap Delta (where ruins including the famous Nankoweap Granaries can be found) between the years 900 or 1050 and 1150, but were all but gone by the early 1200s. As we stood among the ruins, we couldn’t help but wonder whether the ancient inhabitants of this place had witnessed a partial eclipse like the one we were standing under, or—even more exciting and frightening—a total eclipse like what many in the U.S. traveled hundreds or thousands of miles to experience. What would they have thought of the eerie dimness that overtook the landscape as the sun waned into the same crescent shape we knew from observing the moon’s cycles? Unfortunately, the Park Rangers could shed little light on the subject as Wupatki’s inhabitants left no traces that they had observed such an event. We did learn, though, that their neighbors to the east, Ancient Pueblo People who occupied Chaco Canyon in New Mexico from 900-1150 and who were believed to have subsequently abandoned their settlement in the wake of a 50 year drought, were notorious sky watchers whose complexes were aligned with pivotal points in the orbits of the sun and moon. The inhabitants of Chaco Canyon are even thought by some to have recorded the AD 1054 Crab Nebula supernova in petroglyphs. Surely these contemporaries of the Sinaguan residents of Wupatki would have seen and postulated explanations for an eclipse like the one we’d come out to observe. Today, the descendants of all these ancient peoples live throughout the Southwest. Just east of Wupatki the Navajo and Hopi Reservations and the Zuni Reservation beyond are the native lands of only a few modern tribes whose members balance the cultural traditions observed by their ancestors with the daily ins and outs of modern life. For most, the eclipse is a sacred time which calls for different types of prayer or ceremony. Perhaps the most strict reverence of the eclipse is observed by the people of the Navajo Nation, the Diné. To the Diné, the Sun and Moon are deities. The Sun (who is male) is in control of death while Moon (who is female) is in control of birth. The eclipse represents a death followed by a birth and a renewal of the universe and all creation. Death and birth are both very sacred events and require that specific acts of reverence are carefully followed. During an eclipse, the Diné people may not eat, drink, sleep, or wash. Instead, they remain inside, calm and still, and pray with a focus on the birth and renewal to come. None of us in the Hatch office has any cultural traditions to observe, so we are excited to look through our protective glasses up at the moon as it passes 70% of the way across the sun and then retreats back into the invisibility of the day. On the way back to the office, we rise in elevation. Outside our vehicle, the plants change from small, wiry bushes to juniper trees, to towering ponderosa pine. As we approach the sunset-colored volcano, we notice that in this area the pine trees are old and covered in red-orange bark. We remark on how fortunate we are to live in an area so beautiful and so diverse with forests, deserts, and the grandest canyons. If you have an opportunity before or after your trip down the Colorado River to explore the surrounding area, we definitely recommend you do so—especially if you can make it coincide with a rare celestial event!